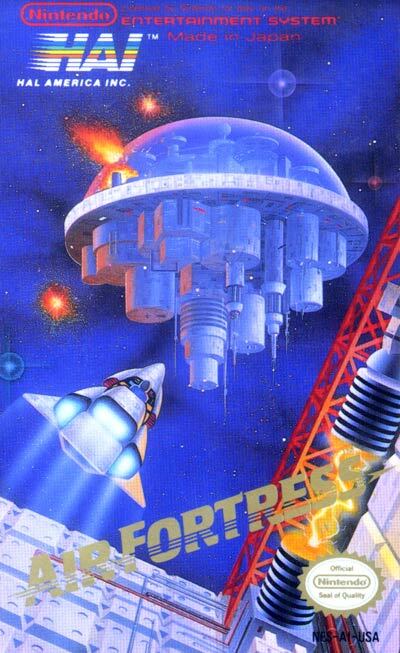 Air Fortress has a fairly typical alien invasion storyline: the people of the planet Farmel, having recently gained the technology for space travel, eagerly explored the galaxy only to find a herd of monstrous "Air Fortresses" moving in their direction. Like the creatures in the later movie Independence Day, the Fortresses behave like interstellar locusts, consuming all of the resources and living things in their path. The Space Federation sends their mightiest fleet, but they are quickly eliminated by the powerful Fortresses. In a final gambit, they send a single warrior (Hal Bailman), outfitted with a shielded spacesuit, powerful weapons, and small lightship to infiltrate the Fortresses and destroy them from the inside out.